Jesus often taught with parables. Bible object lessons are similar in that they take an earthly object like a sponge, penny or mirror and use it to teach a spiritual lesson like how we can know God is near even though we can't see Him. Object Lessons #3 - Made New! Main Point: Help preschoolers understand sin has messed up how we look to God; only God can forgive and clean us so we look new again.
" If anyone belongs to Christ, then he is made new. The old things have gone; everything is made new! Show preschoolers a clean mirror. Let each one look at themselves in the mirror as you ask them - "Who do you see?" Take time to make silly faces in the mirror. Explain that a mirror can show us what we look like. It shows our reflection. In the beginning God created us to be His reflection. We were made to look and be like God. Take a wet erase marker and scribble all over the mirror until they can't see themselves. Ask if that was a good thing or a bad thing to do. Hopefully they say bad! Explain it was a bad thing; the Bible calls bad things we do - sin. The scribbling made it where we can't see ourselves in the mirror. Sin or the bad things we do or say makes it where God can't see Himself in us either. Give them a dry paper towel and see if they can clean the mirror. We can't clean ourselves. Spray water on the mirror (you may even want to write JESUS on your bottle). Tell them that only God can clean us up and make us new. This is called forgiveness. Jesus came to earth to live a perfect life never doing or saying anything bad so He could die on a cross so we could have this forgiveness. 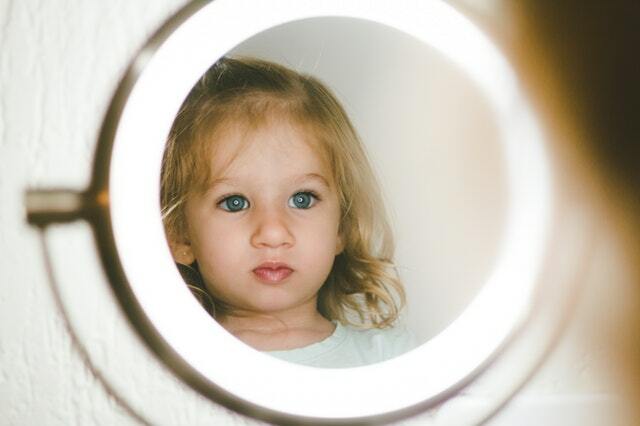 Have the kids help you clean the mirror while repeating, "God can make me new!" Write "God can make me new!" at the top of a sheet of construction paper. Help kids glue a piece of aluminum foil on the paper. Have them look at their reflection and repeat - "God can make me new!" Another preschool object lesson uses air to demonstrate how God is near even though we can't see Him. Teach kindness using cotton balls & rocks!